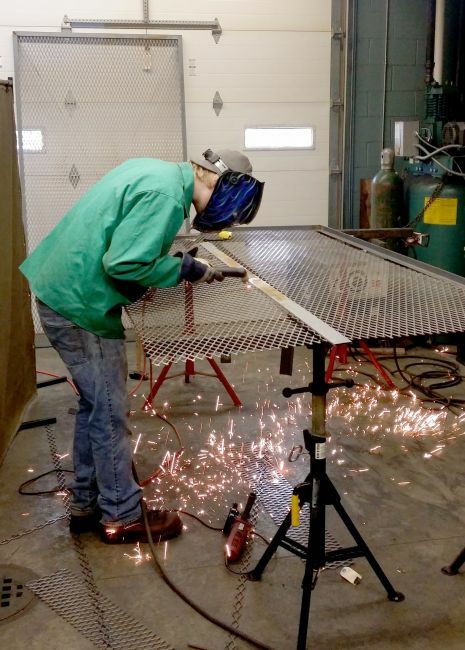 Senior students in welding at West Virginia Northern Community College have completed a significant community service project while gaining valuable experience in their education. David Raveaux, welding instructional specialist and program director, said the students in his spring semester Layout & Fabrication class designed and fabricated cages to be used as a secured records storage system for CHANGE, Inc., a non-profit agency that serves northern West Virginia and Jefferson County in Ohio by providing various programs and services to those in financial need. CHANGE, Inc. (Christians Helping Arrange New Growth Enterprises) was formed in 1983 by a handful of clergy members who wished to aid families affected by layoffs from Weirton Steel find new employment. Since that time, it has grown into a full-circle agency, addressing many of the needs of the communities served. With more than 30 years of operation, the belief of empowering families is still strong within the agency, it was noted. More information about WVNCC’s welding classes is available by contacting David Raveaux by email at draveaux@wvncc.edu or by calling 304-214-8851.